Hey! Were you fooled on this one? The round bluff was fairly easy to spot, but the bluff is only the inner ring of this crater, which is called Gosses Bluff. 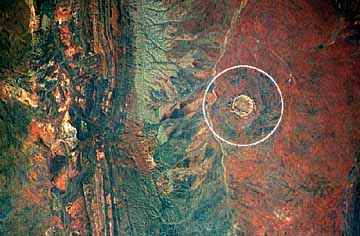 This is another old crater, about 143 million years old, and most of the outer ring is eroded away. It can only be spotted in this image by the different color of plants in the shattered rock inside the crater. Exploration on the ground has shown that the sub-surface structure of the original crater roughly matches the ring of darker plants, but the plant pattern is very hard to see while standing on the ground. This is one case where images from space have been a great help in studying the crater.